Stem: wiry, generally rooting adventitiously [or not] from downward-growing leafless shoot-like structures (rhizophores), branching variable, generally not fragile when dry. Leaf: many, simple, overlapped, appressed, small, +- scale-like, 1-veined, generally grooved abaxially [or not] nearly to tip, generally +- of 2 kinds ("under-leaves" under main stem, "over-leaves" over it). Cone: paired or 1, terminal, generally 4-sided, fertile leaves not like sterile, generally strongly keeled. Sporangia: 1 per leaf axil, 2 kinds, male (generally more distal in cones, spores many, small), female (spores (1)4, large, generally orange-yellow). Genera In Family: 1 genus, +- 700 species: worldwide, generally tropics, warm temperate. Unabridged Note: Despite recent progress in understanding relationships (Zhou et al. 2016 Cladistics 32:360--389; Weststrand & Korall 2016 Amer J Bot 103:2136--2159), future taxonomic changes in the family are likely. Scientific Editor: Alan R. Smith, Thomas J. Rosatti, Bruce G. Baldwin. Etymology: (Latin: small Selago, ancient name for some Lycopodium) Note: Some cultivated as groundcover, curiosity: Selaginella kraussiana; Selaginella lepidophylla (Hook. & Grev.) Spring, resurrection plant. Hand lens, generally at +- 20×, required for leaves (shape, margin, awn at tip), cones. Unabridged Note: All native California taxa are in the Rupestrae clade (Weststrand & Korall 2016 Amer J Bot 103:2160--2169), also treated as section Homoeophyllae (Zhou et al. 2015 Taxon 64:1117--1140) or, formerly, the nomenclaturally ambiguous subgenus Tetragonostachys (Jermy 1986 Fern Gazette 13:117--118). 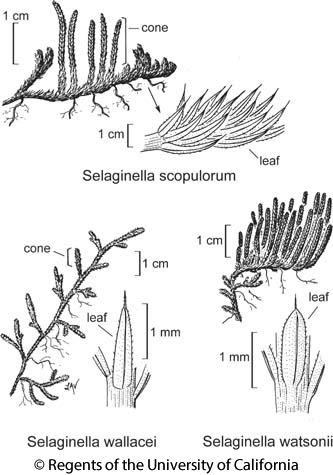 Selaginella shared a common ancestor with Isoetes, +- 380 million years ago (Larsén & Rydin 2016 Int J Pl Sci 177:157--174). Habit: Plant in shaggy cushions, dense to +- open but branches generally close enough to +- obscure internodes, shoots with a robust, braided appearance; green aging +- orange-tan then gray. Leaf: of main stems 1.5--4 mm, 0.4--0.7 mm wide, lance-linear to oblong, decurrent, base glabrous; distance from end of abaxial groove to base of awn generally > 1/3 maximum leaf width, tips of leaves of sterile stems +- thickened around end of abaxial groove; awn 0.2--0.5 mm, generally entire, rigid. Cone: 5--35 mm. Ecology: Open rocky sites, conifer forest, alpine; Elevation: 1350--4100 m. Bioregional Distribution: KR (Trinity Alps), SNH, TR, PR, n SNE, W&I, n DMtns (Telescope Peak); Distribution Outside California: to Oregon, Montana, Utah. Citation for this treatment: Paul Wilson & Thomas J. Rosatti 2012, Selaginella watsonii, in Jepson Flora Project (eds.) Jepson eFlora, http://ucjeps.berkeley.edu/eflora/eflora_display.php?tid=44094, accessed on April 24, 2019. KR (Trinity Alps), SNH, TR, PR, n SNE, W&I, n DMtns (Telescope Peak); Markers link to CCH specimen records. Yellow markers indicate records that may provide evidence for eFlora range revision or may have georeferencing or identification issues. Purple markers indicate specimens collected from a garden, greenhouse, or other non-wild location.